Baby and Costa made a great couple. Baby ,the blue and gold in the picture, passed away on September 15, 2008. Baby was a favorite model of parrot photographer Bonnie Jay. Baby was often featured on Bird Talk magazine covers. If you subscribe to Bird Talk you can see one of her covers that is part of a tribute to Baby and her beauty. Costa and I miss Baby greatly. Princess is the Tucuman Amazon on the left. Princess came to us as did 30 other birds from Ventura Animal Control. The birds, along with 75 others, had been abandoned when a back yard breeder lost his property. Parrots First took possession of the 30 birds on December 26, 2008. Princess had been too afraid to come anywhere near the bars of her cage when a human was present. She often cried softly in the night. My heart has gone out to her in particular. We are makingprogress and she no longer backs away. Her mate, Mr. Gomberg, is less afraid but a bit less eager to accept me. Everytime that the Parrots First Newsletter goes out the calls and E mails start to come in. Our volunteers and supporters are surprised by new rescues that we have been involved with and amazed at how many new birds have come in to our care. With this blog we hope to keep everyone informed as to the daily workings of Parrots First. I am anxious to share the tremendous progress that our birds make in their journey to trust again and to start new lives. Parrots First has evolved to be much more than a rehomingorganization. 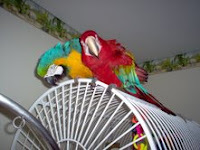 Parrots First is truly a healing place for the birds that come to us. 16 queries in 0.119 seconds.